British Airways launched its new lounge in Rome Fiumicino yesterday. “Spread over 460 square metres, the space can comfortably host nearly 140 customers. It also features a number of zones that create separate spaces for customers to work or relax in ahead of their flight. The centre-piece of the lounge is a granite topped feature bar, with bespoke lighting and comfortable low seating. During peak times the bar will be hosted by a mixologist enabling customers to sit back and relax as their drink is made to order. 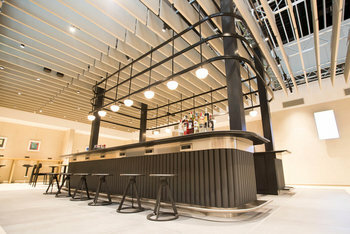 In quieter periods, the design of the bar allows customers to help themselves from the wide range of beverages on offer. Whilst not strictly miles and points related, I thought this was an interesting story which would appeal to a lot of readers. Those of you with long memories may remember that the Queen Elizabeth 2 cruise ship was sold to Dubai, via the Dubai World holding company, back in 2008. Her final voyage ended in Dubai and the liner was handed over. The timing, of course, was terrible. The financial crisis hit Dubai very hard and plans to turn her into a floating hotel hit the buffers. For many years the ship sat in the port, still requiring a full-time crew of 40 to keep it operational. The market finally turned and conversion work began. On 18th April, the QE2 will reopen as a hotel via a ‘soft launch’ ahead of a formal reopening in the Autumn. You can find out more, and book, on the QE2 website here. Thanks to Neil for this. Aegean Miles & Bonus, a Star Alliance airline, becomes the latest Heathrow Rewards mileage transfer partner today. The conversion rate is the standard 1:1 in multiples of 250 Heathrow Rewards points. If you make a points to miles transfer by 31 May you will be entered into a competition to win return flights on Aegean between Heathrow and Greece, as well as a pair of return Heathrow Express standard class tickets. If you are not already a Heathrow Rewards member, remember that there is still a 3,000 points sign-up bonus (triggered with a £150 spend in one day) which would get you 3,000 Aegean miles. Heathrow Rewards also partners with Virgin, BA, Emirates, Singapore Airlines, Lufthansa and Royal Brunei. I’ve just booked a CE flight & hotel package to Rome so it’ll be nice to check out the new lounge. Rob, I’ve booked the Hilton Garden Inn for this trip, so does that mean I’ve forfeited all my HH gold perks by booking via BA? QE2 location is not great. Too far from anything and the timings are best-case scenario…which means add more time. Gallery of pictures doesn’t look inviting. Did a dummy booking for June and got something like AED600 with taxes per night. Way too high given other options. Would pass on this -even for nostalgic purposes. I was in the Plaza Premium (via LoungeKey) next door yesterday and it was the best lounge experience I’ve had for a good while…..
Off to Rome in June so will be checking this out! OT: what is the most (points) effective way to top up Revolut? No fees from Revolut, however there may be fees from the card issuer. The twice I’ve tried it have both been rejected; mine is a new Curve card however. Well mine is also a new Curve, so I guess I’ll just put it on my usual debit card then. I realise this isn’t what you’re asking, but I did a withdrawal in Germany on my curve card after linking it to my Lloyds Avios m/c and switching currency to Euros and came up as a purchase in Euros at the airport. No charges and earnt some avios! Since you mentioned, I need to report that HSBC Premier card is now considering curve cash withdrawn as cash withdrawn and charging interest on top. I wasn’t sure if the interest charged on my card was due to curve or revolut, but the CS confirmed it is curve. I have now upgraded to the debit card version and i will report back next month. I’ve topped up my Cash Passport using Curve linked to my Lloyds Mastercard. So far no interest or other charges showing on my statement. The mixologist idea sounds like a 15 minute wait just for a glass of wine whilst a couple of watery yet colourful cocktails are ‘mixed’ by a Tom Cruise wannabe. My last trip on the QE2 was Southampton to New York in January 2006. It was the first leg of the World Cruise, complete with Salvation Army band sending us off from in the fog from the quay. Obviously under-sold, we paid a little under £300 including the flight back to Heathrow. I can’t see any such bargains on the horizon for the stationary QE2. Wow. Bargain of the century. We did our first cruise on the QE2 to the fjords, splashed out for Princess Grill as she was running up to retirement at the time. Loved her, pure class. Will always regret not doing QE2 out and Concorde back (or vv) from New York. It was planned for a big birthday but fate intervened. OT: Can you still get bonus points for applying for a supplementary partner card on the Amex platinum. I believe so, but remember that you only get one free; after that they cost £170 per year. Gold and green are free but no points. Has anyone got a supplementary in their own name (type ‘other’) recently and got points/been charged? Didn’t some people have success in getting (I think) 3k points for adding their first supplementary partner card on the Gold card? But it seems to be more luck (or an I.T. glitch) than anything set in stone? That’s my recent experience — didn’t use a special webpage to add the partner card, but received 5000 bonus points anyway. Does anyone know if the same is true on the BA cards? There have been occasional partner card promotions in the past. Does anyone know if you get bonus points for adding supplementary cards on the SPG? Flying out of Bangkok soon, on BA CW. Any idea which lounges I can use and which is the best? Qatar have opened their lounge recently so try that. Other than that Cathay is probably the best. You can you go in Japan Airlines lounge too. OT – Quick Q – If I book a hotel with any AMex Gold PRG vs BA Amex PP – is there any difference in protection if the company goes bust, i.e section 75 for a credit card i understand, but not sure re protection with a charge card. Obviously have travel insurance so can claim that way too. Amex Gold is charge…and a refund would be at the discretion of Amex..
BA PP is credit…and subject to section 75 coverage. OT: I’ve done my best to do my research before asking – spent a good hour looking through as much of HFP as appears relevant, and read ALL the way through the lengthy FT thread on the topic, without an answer. I am hoping TripRep, in particular, may see this – re: BA 2-4-1 downgrade outcomes. We travel next week. I know it’s a low probability, but want to be forearmed. What is the right play if ONE of us is downgraded (likely my partner – the “companion”)? 1) Can we insist on being sat together (and so either both being downgraded, with compensation, or both travelling in the class booked), based on the T&Cs of the voucher? 2) Can we request to be moved to a different flight (later or earlier)? If yes, can we insist BOTH of us are moved rather than travel on separate flights which we are not prepared to do? 3) If we do either of the above, to what extent would we forfeit our rights to reimbursement/ compensation? 4) What other eventualities/ options would you advise me to prepare for? AFAIK you have no rights except that BA has to get you back in a timely fashion (if that means no BA seats for a week, irrespective of seats on other airlines, that is acceptable it seems) and pay for a hotel and food whilst trying to do so. In reality you may choose to pay for a seat on another airline (at full fare of course) and then sue BA later to get the money, a case you would probably – but not certainly, which is an issue as probably £5000 would be at stake – win. 4) for now don’t worry about it, it seems to be very rare but people who it has happened to make a lot of noise about it (understandably). If you can’t check in online or you don’t get a seat allocated when you do then that’s the time to start to worry, but even then there are lots of possibilities that don’t involve a downgrade. If this happens then maybe have a view on whether you’d rather just get to destination anyway or willing to travel indirectly or next day or what. But basically (4) as above. Unfortunately all the theory goes out the window when you are faced with a disinterest eheck in or gate agents who much prefers to gossip with other disinterested colleagues. Reality is you often have to make a quick decision on whether you are getting on the plane or not. Probably safest option is just to get on and try to sort out the mess later. Hi Rob, what value per point do you typically value Marriott points? OT- Did anyone else receive 10000 bonus for booking direct with IHG for stays before mid-June? I am 11 months into my BA Amex card year. At the beginning of the year I had the Premium Plus, spent over £10k, earned the companion voucher and greatly enjoyed using it. I downgraded to the free card a couple of months ago and focused my spend elsewhere. I have just noticed that I have spent £18.5k this year, and the Amex website tells me that I need to spend £1.5k in the next month to get a companion voucher. Obviously it is only one voucher per year irrespective of spend, but it is rather cruel for the progress tracker to suggest another voucher is imminent! If you’re spending £20k on the card, would getting another BAPP for a partner be an option, or applying for the Lloyds card while there’s still time for an upgrade voucher?